In a medium saucepan, bring coconut milk to a simmer over moderately high heat. When the milk begins to simmer, whisk in cocoa powder, maple syrup, salt, cinnamon and chile. Continue to whisk while the mixture simmers, about 2 minutes. Remove from heat, and add chopped bittersweet chocolate. With a wooden spoon or a spatula, stir until the chocolate is completely melted. Using a fine sieve to take out any little lumps, strain the chocolate mixture into a large glass measuring cup. 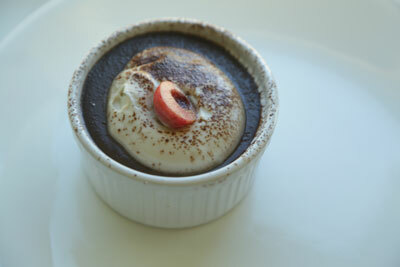 Pour the strained chocolate mixture into four ramekins or small bowls. Refrigerate the pots de crème along with the unopened can of heavy coconut cream, a large mixing bowl, and beaters from an electric mixer, for at least 6 hours or overnight. Just before you’d like to serve the dessert, remove the coconut cream from the fridge. Place the cold hardened cream into the chilled mixing bowl. Beat for 30 seconds on medium speed with an electric mixer with chilled beaters until creamy. Add vanilla extract and mix until smooth and creamy, with mixer on high speed for about 60 seconds more or until soft peaks form. Serve pots de crème chilled with a dollop of coconut cream and any topping you’d like!